The U.S. Navy had been working with the Curtiss Engineering Company of Garden City, Long Island to develop a seaplane capable of a transatlantic flight. By May of 1919, the Curtiss Company had four NC (Navy/Curtiss) or Nancy ships ready for the flight. These huge seaplanes each held a crew of six. The ships were numbered 1 through 4 and were meant to proceed together across the Atlantic Ocean. Only three of the ships were able to make the flight because the NC-2 was used for parts for the NC-1 which was damaged in a storm. 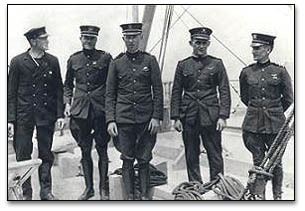 On May 8, 1919, the NC-1, NC-3 and the NC-4 left Far Rockaway Naval Air Station on Long Island on the first leg of their journey to Halifax. Commander John Towers had chosen the NC-3 as his flagship, under him were Lt. Commander P.N. L. Bellinger in the NC-1 and Lt. Commander Albert C. Read in the NC-4. On the way to Halifax the NC-4 had engine trouble and had to taxi into port at Chatham, Massachusetts. Fortunately for the crew of the NC-4, the NC-1 and the NC-3 were held up at Trepassey by foul weather and the NC-4 was able to catch up with them. On the evening of May 17th, the weather cleared and the three ships started their journey across the Atlantic to the islands of the Azores off the Portugal coast. The Nancys followed a trail of U.S. Destroyers strung across the Atlantic. Radio contact was made with each destroyer as they came into range. After dark, the destroyers fired star shells from anti-aircraft guns in order to keep the NCs on track. After 19 hours in the air and only 100 miles from the Azores the ships came into dense fog. The NC-1 came down out of the fog and made a landing in what turned out to be 20 foot swells. They were able to radio an SOS and 4 destroyers broke the line to search. Within a few hours, they were rescued by a Greek freighter. When a destroyer reached them, it attempted to tow the plane but was unable to and was forced to sink it. The NC-3 was also forced down by the fog. After 52 hours in rough seas, Commander Towers and the NC-3 crew taxied into the Ponta Delgado harbor of the Azores. Towers refused a final tow into the harbor after he and his crew had taxied alone over 205 miles of ocean. The NC-4's extra speed allowed it to pull ahead of the others in the fog and find an opening just near the Azores harbor. The NC-4 landed in the Ponta Delgado harbor, completing the most difficult leg of her journey across the Atlantic. On May 27, 1919, the NC-4 landed in Lisbon, Portugal to become the first airplane ever to cross the Atlantic Ocean.